The holiday shortened trading week proved to be a good one for gold and silver bugs but the equity markets still seem to be in profit taking mode. Gold broke through the US$1,500 per ounce mark, while silver breached US$46 per ounce but the broader resource rich Canadian markets failed to follow suit. Once all the trading was done this past week, the TSX Ventures Exchange, home to more junior exploration companies than anywhere else in the world, had dropped 0.41 of a per cent, while the TSX Gold Index managed to add 1.78 per cent. Looks like merger mania is continuing in the resource space. Yep, this past week it was Capstone Mining looking to add more copper to its portfolio and Hathor Exploration looking to consolidate its uranium interests. Capstone has offered to buy Far West Mining in a C$725 million friendly transaction. Under the proposal Far West shareholders will get C$1 in cash, plus 1.825 Capstone shares for each Far West share. Of interest to Capstone is Far West’s Santo Domingo copper-iron-gold project in Chile. The asset has an indicated resource of 485.5 million tonnes grading 0.57 per cent copper equivalent. The bid is being backed by South Korea's state-owned Korea Resources, which will acquire a 30 per cent interest in the Santo Domingo copper project by paying US$210 million to Capstone. Korea Resources will also take an 11 per cent equity interest in Capstone by paying a cool US$170 million. In return Korea Resources will get to buy 50 per cent of the copper and iron concentrate produced by Santo Domingo. Capstone ended the week down C$0.25 at C$3.96, while Far West tacked on C$0.40 to close at C$8.08. Hathor Exploration has agreed to buy Terra Ventures in a move that consolidates the Roughrider uranium project in Saskatchewan. Under the friendly deal, Terra shareholders will get 0.2 of a Hathor share for each Terra share held. Hathor ended the week up C$0.23 at C$2.18, while Terra added C$0.085 to close at C$0.42. Right after denying rumours of a possible takeover, Banro announced that it has signed a non-binding memorandum of understanding with China Gold International Resources to negotiate a proposed joint venture transaction on the development of Banro's Twangiza property in the Democratic Republic of the Congo. Banro added C$0.81 to close at C$3.51. Seems a sensible solution for a tricky problem at last. On the earnings front, Teck Resources tabled first quarter profits that more than doubled thanks to strong coal and copper prices. On an adjusted basis, the diversified base metal miner earned US$450 million, or US$0.76 per share in the first three months of 2011, up from the US$198 million, or US$0.34 per share tabled in the same period of 2010. Teck ended the week up C$4 at C$53.83. Quadra FNX also rode the base metal train by releasing production figures for the first quarter. The miner produced 46 million pounds of copper and that was good enough for a C$1.80 jump in its share price to C$15.54. On the down side, shares of Eastern Platinum dropped C$0.13 to close at C$1.17 after the company reported a decline in its quarterly production. The Crocodile River mine in South Africa, produced 25,387 ounces of platinum group metals a 17 per cent drop from the same period a year earlier. Chief executive Ian Rozier pointed to an improvement later this year when the shallow Crocette deposit comes on stream. Over to the drill bit where Extorre Gold sparked some excitement by reporting the initial drill results from the recently discovered Zoe Vein on its Cerro Moro gold-silver project in Argentina. Highlights included 4.84 metre grading 64.6 grams gold and 7,530 grams silver per tonne. Extorre ended the week at C$9 for a C$2.02 gain. Not to be out done, Newstrike Capital cut 230.95 metres running 7.51 grams gold per tonne at its Ana Paula project in Mexico. Newstrike closed up C$0.65 at C$2.29. Kalimantan Gold got a boost after announcing that it has entered into a joint venture agreement with a wholly-owned subsidiary of Freeport-McMoRan Exploration over the KSK Contract of Work copper project in Indonesia. Freeport can earn a 51 per cent interest in the project by spending US$7 million over three years and then can boost it to 75 per cent by completing a feasibility study. Kalimantan added C$0.01 to close at C$0.11. Yukon explorer Tarsis Resources added C$0.18 to close at C$0.81 on news that Kinross Gold will buy 9.9 per cent of the company through a private placement at C$0.60 each. All lights are green as the junior exploration companies edge closer to the field season in northern Canada. Taking center stage should be the Yukon explorers with most getting active in mid-May. We will see what next week has in store. Which may be attractive since your dollar might be problematic again. Well spotted. The Australian currency is playing an increasingly important role as it continues a seemingly relentless upward march. Last week saw a gain of another US2 cents with the Aussie sitting at $US1.07 just before the Easter shutdown. That means we’re up (or the U.S. is down) by 16 per cent over the past 12-months, and a whopping 51 per cent over the past 24 months. Which also means a considerably currency drag on export earnings. It is becoming quite painful for farmers, miners, manufacturers and the service sector. But, since we’re into mining let’s look at what happened to share prices last week as the currency effect bit into higher U.S. dollar commodity prices. Gold and silver stocks, as you might expect, did best, but not excessively. Other miners did less well. The indices tell the overall story with the gold index up 2 per cent, the all ordinaries up 1 per cent and the metals a mining industry absolutely flat. Let’s have a quick call of the card, starting with gold and silver, please. Before prices a very stark example of what the currency change did to last week’s record upward surge in the gold price – it turned it into a fall on conversion to Australian dollars. When we spoke a week ago the U.S. dollar gold price was US$1476/oz, and exchange rate US$1.05 to produce an Australian gold price of A$1405/oz. This week the late Thursday gold price was US$1501/oz and the exchange rate US$1.07 to produce an Australian gold price of A$1402/oz, switching a US$25/oz rise into a A$3/oz fall. Enough of the big picture stuff. Let’s move swiftly through prices. Medusa Mining (MML) was the pick of the gold stocks with a rise of A61 cents to A$8.33. Cobar Consolidated (CCU) was the pick of the silver stocks, adding A17 cents to A$1.13. Other good gold rises came from: Kingsgate (KCN), up A31 cents to A$7.81. Troy (TRY), up A4 cents to A$3.83. Olympus (OYM) up A2 cents to A41 cents. Gold One (GDO), up A6.5 cents to A50 cents, and Dampier Gold (DAU), a newcomer but one with its foot on the old Plutonic mines in Western Australia, up A1.5 cents to 58 cents. Losing ground: Catalpa (CAH), down A10 cents to A$1.52. Ausgold (AUC), down 3 cents to A$1.59 and Noble (NMG), down A5 cents to A67.5 cents. Base metals and iron ore next. Not a lot of action in the non-gold sectors. Best of the copper stocks were PanAust (PNA), up A5 cents to A80.5 cents. Sandfire (SFR), up A20 cents to A$7.17. Sumatra (SUM), up A5.5 cents to A36.5 cents, and Exco (EXS), up A5 cents to A67 cents, as it heads into an interesting time over an asset sale to Xstrata. Copper stocks to lose ground included: OZ Minerals (OZL), down A2 cents to A$1.50, and Bougainville (BOC), down A4 cents to A$1.57 despite optimistic comments in Papua New Guinea that a deal is close on reopening its mothballed Panguna mine. Nickel and zinc stocks were mixed. Western Areas (WSA), the best of the pure nickels, up A13 cents to A$7.19. Mincor (MCR) led a handful to lose ground, down A3 cents to A$1.28. Kagara (KZL) was the best of the zinc miners, up a modest A1.5 cents to A64 cents. Meridian (MII), posted the heaviest decline, down A2 cents to A10.5 cents. Most iron ore stocks marked time, or lost a few cents. Sherwin (SHD) slipped A1 cent lower to A20 cents, with Atlas (AGO) losing the same miniscule amount of A1 cent to A$3.64. Fortescue (FMG) added A1 cent to A$6.49, and Gindalbie (GBG) recovered A2 cents to A$1.06. Coal, uranium and the minor metals and then you can have a hot cross bun. A mixed bag in those areas with no discernible trend ahead of the Easter break, which for us combined this year with the annual April 25 Anzac Day holiday. Coal stock to rise included: Macarthur (MCC), up A25 cents to A$12.28. Continental Coal (CCC), up A0.6 of a cent to A6.1 cents, and Guildford Coal (GUF), up A3 cents to A$1.19. Going the other way were: Carabella (CLR), down A8 cents to A$2.21. Hunnu (HUN), down A6 cents to A$1.59, and Stanmore (SMR), down A11 cents to A$1.28. Tin explorer, Kasbah (KAS) was the best performer among the minor metals, adding A3.5cents to A30 cents. MetalsX (MLX), which has offloaded a nickel project in central Australia, rose A2 cents to A31.5 cents. Rare earth stocks were down modestly. Alkane (ALK) lost A7 cents to A$2.54 and Lynas (LYC) shed A8 cents to A$2.45. Spot gold surged to the highest on Friday in thin holiday trading, hitting a record for the sixth consecutive session as the dollar weakened and a number of factors ranging from geopolitical fears of inflation uncertainty. Silver also raced to its loftiest in 31 years, notching the milestone for a seventh straight day and outstripping gold's weekly gains by a huge margin. The ongoing euro zone sovereign debt crisis, unrest in the Middle East and North Africa, rising global inflation, and most recently worries over the fiscal stability of the United States have fueled the record-breaking rally in these precious metals. Spot gold rose to an record of $1,512.50 an ounce, before easing to $1,507.69 by 0853 GMT, on track for a weekly gain of 1.5 percent -- its sixth consecutive week of gains. Spot silver hit $46.69 an ounce, its highest since 1980, on course for a weekly rise of 8.4 percent, its biggest weekly increase in two months. Silver has gained 51 percent so far this year, and gold 6 percent. This compares with a corresponding 1 percent rise in the London Metal Exchange price of copper, the bellwether of the industrial metals complex. Supporting precious metals, the dollar was languishing near a three-year low against a basket of currencies, and could take a run at the all-time low hit in 2008, pressured by record low interest rates and the crushing weight of the U.S. budget deficit. However, a correction might be on the horizon after the recent rapid ascent, traders and analysts said. "Gold is likely to consolidate around the $1,500-level next week," said Li Ning, an analyst at Shanghai CIFCO Futures. "The angle of the recent rally is very sharp, and we are bound to see some correction in the near term." MORE STEAM TO RUN ON? Spot gold has rallied more than $50, or 4 percent, in the past eight sessions. The Relative Strength Index, or RSI, rose to nearly 75, a level unseen since October last year, suggesting the market has been heavily overbought. However, Shanghai CIFCO's Li said gold has more steam to run on and expected prices to peak at $1,550 by the end of the second quarter, buoyed by the Middle East unrest, sovereign debt concerns on both sides of the Atlantic and inflation worries. The Shanghai Gold Exchange has started a trial for over-the-counter trading, providing a convenient tool for institutional clients to trade large quantities of gold, to catch up with exploding investment demand in China. Holdings in the physically backed exchange-traded precious metals funds dipped ahead of the long Easter weekend. SPDR Gold Trust , the world's biggest gold ETF, saw holdings dip 0.6 tonnes to 1,229.643 tonnes. Financial markets in Singapore and Hong Kong are closed on Friday for a public holiday, and Hong Kong will remain closed on Monday. TOCOM prices in yen per gram. Spot prices in $ per ounce. China oil demand seen rising 10.9% in March compared with the previous year but down 4.0 percent from February as refiners produced less fuel and falling net imports. output. All volumes are shown in barrels per day. * Reuters calculates China's oil demand by adding the total amount of crude refined during the relevant period, as reported by the National Statistical Bureau, to net imports of major oil products reported by Customs. It also does not take into account the 1-2 percent loss in overall product volume created by the refining process. Nor does it include the small amount of crude that is directly burned as fuel at oil fields or power stations or that is used by small, unreported 'teapot' refineries. Demand by product is calculated by the refinery output for each product plus net imports. Copper prices in London on Wednesday climbed along with other LME base metals, supported by the weakening dollar and optimism about the prospects of the U.S. property market. Three-month copper on the London Metal Exchange rose 1 percent to $9,437 a tonne by 0727 GMT. Copper rose 1.3 percent in the previous session, snapping a six-session run of losses. "Perhaps the market took some solace in the U.S. housing numbers and reacted positively to it. However, it could be that it is rebounding from the day before when it got a bit carried away with S&P's threat of a U.S. sovereign credit downgrade," OSK-DMG's Chief Group Economist Thomas Lam said. Following Tuesday's strong numbers, there was a sense in the market that Wednesday's data could beat forecasts for a 2.5 percent rise in existing home sales for March. Upcoming holidays -- with London closed for four out of the next eight trading days -- could also lead to brisk trade. "The Easter weekend is coming up, so traders may be doubling up to clear up positions, causing base metal prices to rise in the meantime," Macquarie Bank Research Analyst Bonnie Liu said. Copper was also supported by a weaker dollar, which dipped 0.4 percent against a basket of currencies , falling back towards a 16-month trough of 74.617 set last week. Financial markets stumbled on Monday, sending copper to its lowest in around a month, after ratings agency S&P warned that it may downgrade the United States' AAA debt rating unless it can bring its budget deficit under control. Shanghai's most-active copper futures contract SCFcv1 rose 1.9 percent to 71,060 yuan a tonne. Technically, Shanghai copper could rebound into a range of 71,120 to 71,660 yuan per tonne, while LME copper could rise further to $9,488 per tonne, according to Reuters technical analyst Wang Tao. "LME copper prices have been moving within a range of $9,000 and $10,000, only breaching that upper limit once in February before falling back quickly," Great Wall Futures Analyst Li Rong said, adding that the market may be due for an upward correction in the fourth quarter. LME copper stocks rose 175 tonnes on Tuesday, to 451,950 tonnes, their highest since June, equivalent to a little over eight days of global supply. LME aluminium rose 0.9 percent to $2,738, extending Tuesday's 1.5 percent rally. It touched a top of $2,741 earlier in the session, its highest since August 2008. According to technical charts, a bullish target has been established for aluminium at $2,779 in the near term. China had an annual capacity of around 20 million tonnes in 2010, around 40 percent of the world's 50 million tonnes, Reuters Metal Production Database shows. The market expects Chinese aluminium output to exceed consumption by 1 million tonnes. A concerted, effective crackdown would cut that, and if maintained, could turn the country into a net importer, with the potential to lift global prices. Previous efforts by Beijing to rein in the sector had started to bite during late 2007 and 2008, but were relaxed during the financial crisis and in some cases replaced by incentives to expand output as China strove to maintain employment and growth. The latest circular on the subject, however, read slightly tougher than usual, citing that individuals could be asked to take legal responsibility if state policy was not followed. LME nickel prices rose 1.7 percent to $25,725. "The rise in nickel prices seems to have more to do with strong physical demand than the short-term effects of the weaker dollar and better outlook for the U.S. property market. The utilisation rate in China is pretty solid, but production has also started to increase, so I don't expect prices to rally too much," said Macquarie's Liu. Comex gold futures prices hit a record high $ 1.500 / oz. Tuesday before finally returning to $ 1,400 at the end of the day, and then topped the benchmark in early trading Wednesday, blow sounded a lot like "I told you so." Gold Reports expert contributors explain what this milestone means for investors ahead. The exact price of gold in dollars may not be as meaningful a number, according to Taylor, as how much an ounce of gold will buy. Based on that number, the nominal price of gold could even go down, but the relative absolute purchase price could continue to rise. “The real price of gold will remain high for a long time to come,” he said. For that reason, Taylor is bullish on gold mining shares. He pointed to surging profit margins of aggregate gold mining shares as proof that gold is a sound investment today and for years to come. “This is the buying opportunity of a lifetime in gold mining shares,” he said. The declining dollar in the wake of a Standard & Poor’s rating agency outlook downgrade and increasing oil prices signaling possible inflationary pressures was also good news for silver, which hit a 31-year high of $44/oz. on Tuesday. Taylor called it “the poor man’s gold” and said it could also hit historic highs as investors flee an unstable paper market. James West, publisher of The Midas Letter, agreed that the worldwide counterfeiting of money is driving the demand for gold and, in his view to an ever greater degree, silver. “In terms of pure performance, whereas gold has delivered a solid gain of 26.51% in the course of the last year, silver has outshone gold spectacularly, turning in a gain of 123.55%, making it the commodity trade of the year by far.” He ventured to say that $5,000/oz. gold and $300/oz. silver could be a reality in the not too distant future. Roger “Trader Rog” Wiegand, editor of Trader Tracks, had predicted a cyclical high for gold of $1,507/oz. and a yearly high of $1,607/oz. His silver crystal ball shows the metal rising to $45.25/oz., then as high as $51/oz. before people get scared and start getting out, leaving the wise investors to pick up and take it as high as $55.85 this year. “It’s all about cycles and time; it’s just math,” Wiegand said. Still, he didn’t think prices would reach these milestones this early in the year. He follows seven indicators and says geopolitical unrest is only one of the factors pushing prices. An emerging trend over the last year, which he predicts will be even more prevalent by fall, is the breaking away of gold and silver shares from the rest of the stock market. “People want to be in gold and silver and they will stop paying attention to the regular markets,” Wiegand said. His revised forever high number pegs gold at $4,400/oz. and silver at $256/oz. Others have predicted even higher highs. Analyst Alf Field has suggested $10,000/oz. and Economist Martin Armstrong has publicly said $12,000/oz. We, at The Gold Report, will be watching to see if precious metals reach the high bars being set. The price of gold passed $ 1,500 in Hong Kong has further supported this far in Europe, while silver continued to increase even faster than its brother. But, despite perhaps not quite such a strong performance in other currencies it is nonetheless a major dollar barrier which has been broken and the likelihood would appear to be that in the next few days and weeks, as the European economic malaise continues to feature in the news, the U.S. economic recovery disappoints, doubts about China's short term growth prospects and the ongoing fighting and tensions in Africa and the Middle East, the gold price will at some stage probably consolidate these latest gains and move on to yet new highs as any profit-taking dissipates and buying pressure continues. Indeed if a significant advance above this level comes about $1500 could even become the new ‘floor' for the gold price. The next major resistance level is seen as $1520-$1525 providing the $1500 level is maintained through Easter. Barclays Capital noted some support for this viewpoint in a research report earlier in the week that gold had been affected by significant selling pressure at the start of the year on the back of a run of positive macro data. Since then, the report commented, the year's low prices have been propelled higher by a raft of factors supporting investor demand (mostly those noted above) which have outweighed some recent rate hikes to drive prices to fresh highs. But overall, as we have mentioned before, the rising gold price is also an indication of the debasement of the U.S. currency in particular through the excess printing of ‘fiat' money in an attempt to stave off a major global economic depression. European nations are similarly guilty of printing excessive amounts of unbacked currency. In retrospect whether this will be seen by history as a positive move or not obviously remains to be seen. It has as many detractors as supporters among mainstream economists. With negative interest rates actually supportive of holding gold, which of course does not generate interest - a fact which has been considered a significant reason for not buying gold by the metal's detractors in the past - we are likely set for further rises, although May to August has often proved a period of price weakness or consolidation prior to a take-off in late Summer, early Fall. Other precious metals have been dragged up along with gold, although one needs to be a little more cautious here perhaps because if one of the reasons for gold's rise is continuing doubts about the economy then those precious metals with a significant industrial usage - notably platinum and palladium - and to an extent silver - thus have perhaps to be more vulnerable. Silver, though may actually be in a different bracket. It still has momentum, and its past monetary role somehow gives it a gold-like credibility as a safe haven metal and its relatively low price in relation to gold means it is particularly attractive to the smaller investor. However should sentiment towards it change it too could be vulnerable and there are plenty of analysts out there - including some usually strong silver bulls - who are nervous that it may have moved up too far too fast, although they remain positive longer term. But meantime it is steadily moving towards $50 - a level which only six months ago would have seemed incredible! Gold surged to record highs on Friday after the dollar fell to its lowest point since late 2009 against major currencies, along with silver on the highest position in 31 years, while inflation pressures in China also helped lift bullion's appeal. Spot gold was steady at $1,472.50 ounce by 0824 GMT, having hit a record high of $1,479.01 an ounce. Gold is still far below its all-time inflation-adjusted high, estimated at more than $2,000 an ounce set in 1980 as a result of heightened geopolitical pressure and hyper inflation. "We see gold peaking at $1,500 an ounce. We think there could be some more upside in gold in the short term, especially in this environment of high inflation and rising oil prices," said" Natalie Robertson, commodities strategist at ANZ. "There is a lot more upside," said Robertson, adding that the peak of $1,500 would be reached by the end of 2011. Gold's rise to a record only attracted light selling from Thailand and Indonesia, suggesting that investors remained bullish on the outlook. Premiums for gold bars were steady at between 70 cents and $1 an ounce in Singapore. "Generally, higher consumer prices could still be a boost for gold. Going forward, we will be looking at inflation figures from the United States, and if we see an upside surprise, gold can even go higher," said a dealer in Singapore. "If you look at recent price action when China announces interest rate hikes, it hasn't affected commodities that much. Also, because of the fact that gold prices are already so expensive, investors are looking at silver as a store of value." Spot silver rose as high as $42.41 an ounce, its strongest since 1980, with physical dealers in Singapore also reporting buying from speculators. IShares Silver Trust said its holdings edged up to 10,974.26 tonnes by April 14 from 10,969.71 tonnes on April 13. The holdings hit a record of 11,242.89 tonnes hit on April 8. U.S. consumer price inflation numbers due at 1230 GMT will be closely watched for signs inflation may be rising faster than the Fed may expect. U.S. gold futures for June rose as high as $1,480.5 an ounce, a lifetime high. The Singapore Mercantile Exchange (SMX) started trading cash-settled gold futures on Friday, with the contract for June delivery opening at $1,475 an ounce on low volumes. "They need sufficient liquidity before people start looking at the contracts," said the Singapore-based dealer. "It's always difficult to get people to adopt a new contract. You'd always stick to traditional, old benchmarks, such as COMEX gold." Brent crude held steady above $122 a barrel on Friday after China's economic growth beat forecasts despite government efforts to cool expansion and put the brakes on inflation. Traders pay attention to China this week, although there are mixed signals out of the Middle Kingdom. First, the Chinese government announced that the Chinese economy had expanded by 9.7 per cent in the first three months of the year. This was below the 9.8 per cent expansion delivered in the last quarter of 2010, but still beat analyst expectations which had been for growth of around 9.4 per cent. However, Chinese inflation rose to 5.4 per cent in March, up from 4.9 per cent in February. And, with prices now rising at their fastest rate since 2008, the prospect of further rate hikes tempered sentiment and drove gold to a new high of US$1,487 per ounce. Silver followed that lead, putting in a rise to US$43 per ounce. Not all the precious metals were stronger, though. The threat of higher interest rates caused platinum to retreat to US$1,795 per ounce and palladium to drop to US$774 per ounce. The spectre of higher interest rates hit other industrial metals too. Copper closed at US$9,432 per tonne, or US$4.28 per pound, while nickel closed lower at US$26,300 per tonne, and zinc retreated to US$2,408 per tonne. In company news, there was huge market interest in Glencore’s impending super-sized float while the majors retreated on the mixed messages from China. Rio Tinto slipped 4.4 per cent to 4,325p as it announced that its first quarter coal, iron ore, uranium and alumina operations in Australia had been affected, as expected, by earlier extreme weather, although most are recovering output. BHP Billiton closed three per cent lower at 2,507p and Xstrata slipped 3.3 per cent to 1,464p. Anglo American shed 6.6 per cent to close at 3,123p. Fresnillo was prominent in a busy week of news from precious metals miners. The Mexican miner achieved attributable silver production of 10.1 million ounces in the first quarter, 2.2 per cent lower than last year, although gold production hit a record 96,407 ounces, up 13.3 per cent from the prior year. The shares closed 4.3 per cent lower at 1,575p. Gold miner Avocet Mining increased the mineral resource at its Inata project in Burkina Faso to 2.12 million ounces, which represents an increase of 20 per cent over the previously published resource. However, an outbreak of political violence in the country of its operations, Burkina Faso, took the shine off that news as far as investors were concerned. The shares closed 10.9 per cent lower at 222p. The news was even less good for Australian miner Norseman Gold. Norseman slumped 54.6 per cent to 16p as it continued to struggle to lift production from its Bullen and Harlequin underground mines and to ramp up output from the OK Decline. However, the company’s fourth mine, the North Royal open pit, has continued to ramp up and is producing ore broadly in line with schedule. The company is now forecasting gold production for the year of between 55,000 and 60,000 ounces. In South America, Minera IRL continues to return good gold grades from drilling at the Minapampa East zone of its Ollachea project in Peru. The company expects to publish an updated resource estimate by the end of May. The shares closed down 3.3 per cent at 88p. Meanwhile, Minera’s neighbour in Patagonia, Mariana Resources, slipped 14.9 per cent to 27p as it reported further positive intersections from its third drill campaign at its Las Calandrias gold-silver project in Santa Cruz, Argentina. Over in Central Asia, Kryso Resources continues to make progress. Shares in the company gained 4.1 per cent to 15.9p after it updated the mineral resource at its Pakrut and Eastern Pakrut gold prospects in Tajikistan to 3.578 million ounces. The updated estimate incorporates 16 new diamond drill holes that confirm the grade and geological continuity in the main mineralised areas of Pakrut. Also in Central Asia, Kyrgyzstan-focused Chaarat Gold reported further consistency and continuity from drilling at its Contact Project (Kiziltash), following on nicely from the previously announced JORC resource of 4.41 million ounces. Mineralisation has been demonstrated over a strike length of 1,160 metres and to a maximum depth of 900 metres from surface. It remains open both along strike and down dip. The shares edged lower to 52p. Across the border in Kazakhstan, gold miner Hambledon Mining increased year-on-year quarterly gold production by 72.5 per cent as it completed phase 1 of the winterisation programme and equipment upgrade at its Sekisovskoye project. First gold production from underground mining remains on target to start before the end of the year. The shares climbed 9.1 per cent to 4.5p. Meanwhile, Triple Plate Junction climbed 3.5 per cent to 7.5p as it started a 3,000-metre drilling programme at the Pu Sam Cap gold project in Vietnam after it received encouraging assay results from recent field work at the project. Two platinum miners were in the news this week. Jubilee Platinum agreed a binding memorandum of understanding to acquire chromite miner Chemstof. Chemstof holds near-surface platinum-bearing chromitite reefs, an operating chrome ore beneficiation plant and an estimated 500,000 tonnes of platinum-rich surface stockpile. Jubilee closed 6.4 per cent higher at 28.2p. And Aquarius Platinum is to secure new platinum mineral rights on the western limb of the Bushveld through the acquisition of a 74 per cent interest in private South African company Afarak Platinum. The US$109.7 million consideration will be settled by a cash payment of US$70.2 million and the issue of 6,804,162 Aquarius shares. The shares closed 4.5 per cent lower at 345p. In bulk commodities, London Mining climbed 4.5 per cent to 405p after it released details of its pre-feasibility study for phase 2 of its Marampa project in Sierra Leone. Phase 1 is due to begin operations this year. Meanwhile, Mozambique coal miner Beacon Hill Resources raised US$20.3 million through a placing to finance licence acquisitions and improve its logistics chain ahead of maiden coal exports from its Minas Moatize mine, which is expected by mid-year. The shares closed 9.6 per cent lower at 13p. Nautilus Minerals was one of the week’s biggest winners. It climbed 21.2 per cent to 209p after it formed a strategic partnership with German shipping company Harren & Partner to own and operate a production vessel. This will serve as the operational base for Nautilus to produce high-grade copper and gold at its first sub-sea project, Solwara 1, in Papua New Guinea. Harren will design and construct the vessel at a cost of approximately US$167 million, with delivery scheduled for the first half of 2013. Finally, cash shell Q Resources has entered into a memorandum of understanding to acquire the Montecristo copper mine and Santo Domingo processing plant located in the Antofagasta province of Chile. The company is planning a placing to raise the US$110 million consideration, but in anticipation of the deal the shares climbed 3.2 per cent to 16p. Many things are not unexpected, what with fears that China will soon be slamming the brakes on the economy during the heating company through a sharp increase in interest rates. The major indices all fell by around two per cent. Having said that, though, it’s also worth noting that there were plenty of positive movers among smaller gold companies, some of which might not have attracted close attention in London. It is, because a call of the usual suspects produces a few interesting movers, but nothing spectacular. To find the companies that caught the eye of Australian speculators you need to dig a little deeper. And then you discover quite an assortment of gold, iron ore and rare earth companies that performed exceptionally well in a down week. Let’s start with the new names and good news before switching to a roll call of the fallen. Three new, or relatively new, iron ore explorers did well last week, all reaching fresh 12-month share price highs. Amex Resources (AXZ), which was mentioned last week as the company which won a West Australian iron ore tenement in a raffle, continued its upward run, adding another A14 cents to close the week at A71 cents, although it did hit a high of A73 cents during Friday trade. Indo Mines (IDO), which is exploring for iron sands in Indonesia, added A8 cents to A45 cents. And South American Iron (SAY), which is looking for the same sort of material in Chile and Ecuador, reached a fresh high of A14 cents during the week, finally closing out at A13.5 cents for a rise of A3 cents. The notable gold risers included some relatively new players. They were led by Bailey Minerals (BAA), which is perhaps more of a platinum story thanks to a deal recently completed in Colombia, but which also has gold assets in Australia. It rose to a fresh high of A$1.15, before closing at A$1.10 for a gain on the week of A21 cents. Worth recalling that the company was trading at a mere A40 cents as recently as February. Shares in Azimuth (AZH), which is exploring for gold in Guyana, rose A2.5 cents to a closing price of A34 cents, although that was well short of its new peak of A37 cents reached in early Friday trade. YTC Resources (YTC), which is exploring the Hera gold project discovered by CBH Resources some years ago, traded up to a new high of A79 cents, before closing at A75.5 cents for a gain on the week of A6.5 cents. Meanwhile, Gold Road (GOR), one of our long-term favourites rocketed up on Friday to a fresh peak of A81.5 cents before tumbling back to close at A68.5 cents, a closing price which still left it with a gain of A17.5 cents for the week. Outside of precious metals, Northern Minerals (NTU), the old Northern Uranium, was the pick of the rare earth companies after a well received presentation at an investment conference in Sydney. It added A21.5 cents to end the week at A$1.00, but did get as high as A$1.07 on Friday. Alkane (ALK) one of our long-term favourites also continued its rapid rise, hitting a fresh all-time high of A$2.73, before ending the week at A$2.63 for a week’s rise of A38 cents. In mid-March Alkane was trading around A$1.20, and a year ago it was A23 cents. Is that the end of the good news? Close, though it is worth mentioning the continued recovery among uranium companies. Among the interesting news this week, Callabona Uranium (CUU) reported visible secondary uranium mineralisation at its Oak River project in Queensland. Despite a uranium mining ban in Queensland, the shares traded up to a fresh high of A14 cents, double what it was a week earlier, before closing at A13.5 cents for a gain of A5 cents. Two other uranium exploration newcomers were Legacy Minerals (LML) and FYI Resources (FYI) which both attracted attention. Legacy rose 3.5 cents to A19 cents and FYI rose 3.4 cents to A11 cents, but both in very, very, light turnover. To spell out just how light, FYI added A1.8 cents on Friday thanks to a trade of 3,465 shares valued at A$362 which is probably less than the Friday night bar tab of the buyer. Thanks. A timely warning on the importance of volume for investors working in the ultra-small end of the market. Time now to call the card, starting with gold, please. Gold was mixed, trending down, although there were also a few solid risers. Among the best performers was Ausgold (AUC), which continues to impress with its Katanning project, and added another A17 cents to close at A$1.62. Northern Star (NST) also continues to attract attention in the wake of impressive production and discovery news from its Paulsens mine. The shares added A4.5 cents to A41 cents, and might perhaps be worth a closer look soon. A third strong company last week was the soon-to-be silver producer, Alcyone (AYN) which rose by A2.5 cents to A13 cents, but did reach a fresh 12 month high of A14.5 cents at one stage during the week. There was a more modest rise from Cortona (CRC), which awarded a contract for the mining of its Dargues Reef project in New South Wales. Cortona’s shares rise A1 cent to A18.5 cents. Shareholders in Alacer Gold (AQG), which incorporates the old Avoca, were also better off, as the shares rose by an impressive A$1.20 to A$10.43. After the good news comes the bad. Kingsgate (KCN) led the way down, with a heavy fall of A$1.44 to A$7.50 after it issued a production downgrade. Catalpa (CAH) reported something similar and was hit with a sell-off which knocked A16 cents off the shares to A$1.62. Other fallers included Perseus (PRU), down A14 cents to A$3.15, Allied Gold (ALD), down A6 cents to A63 cents, Beadell (BDR), down A3 cents to A87.5 cents, Troy (TRY), down A15 cents to A$3.79, and Medusa (MML) down A28 cents to A$7.72. Integra (IGR) was also weaker, down A5.5 cents to A49.5 cents, but is set to release what is expected to be a rather impressive quarterly early next week with costs said to be attractively low. Thanks to that Integra heads-up, we’ll keep an eye out. Moving on, let’s take a look at some of our regulars in the uranium sector. The regulars in uranium were less impressive than the stars we mentioned earlier. Paladin (PDN) continues to struggle with profitability, and dropped another A10 cents last week to A$3.64. Extract (EXT) slipped A8 cents lower to A$8.47. Berkeley (BKY) fell A4.5 cents to A98.5 cents. Manhattan (MHC) was A10 cents weaker at A70 cents, and Bannerman (BMN) lost half a cent to A41.5 cents. Iron ore and base metals next. It was mainly down among the iron ore companies, although there were one or two risers. BC Iron (BCI) has forced Regent Pacific to reinstate finance for its proposed takeover bid, and that news was enough to lift BC by A12 cents to A$2.96. Mindax (MDX) upgraded the resource at its Mt Forrest project, and its shares rose to A39 cents, up A3 cents as a result. Crusader (CAS) was also better off, up by A6 cents to A$1.27 as Crusader’s Rob Smakman toured London on an itinerary that included a well received presentation at our very own Minesite forum. After that, though, it was downhill. Fortescue (FMG) fell A16 cents to A$6.48. Brockman (BRM) fell A49 cents to A$5.55. Iron Ore Holdings (IOH) fell A6 cents to A$1.76. And Murchison fell A8 cents to A$1.09. There was an easing off in the base metal space too. Syndicated (SMD) and Sumatra were the two copper companies that gained ground, but only just. Syndicated added half a cent to close at A20 cents, and Sumatra added A1 cent to A31 cents. Falls came from OZ Minerals (OZL), down A12 cents to A$1.52, Sandfire (SFR), down A33 cents to A$6.97, Hot Chili (HCH), down A6 cents to A73.5 cents, and Rex (RXM), down A26 cents to A$2.70. Poseidon (POS) was the single nickel company that rose, posting a gain of A1 cent to A28 cents. Falls were recorded by Western Areas (WSA), down A8 cents to A$7.08, Mincor (MCR), down A17 cents to A$1.31, Panoramic (PAN), down A23 cents to A$2.10 and Mirabela (MBN), down A5 cents to A$2.05. It was more of the same in zinc - one rise and the rest down. Terramin (TZN) was the sole company to gain, adding half-a-cent to A37 cents. Then came the fallers: Kagara (KZL), down A1 cent to A62.5 cents, Blackthorn (BTR), down A7 cents to A65 cents, Perilya (PEM), down A1 cent to A64 cents, and Meridian (MII), down half a cent to A12.5 cents. Coal and minor metals to finish, please. There was one strong coal performer, and it was a newcomer as well. Metro Coal (MTE), an emerging thermal coal producer, added A10 cents to A41 cents. Then comes a long list of declines, including: Carabella (CLR), down A27 cents to A$2.29, Coalspur (CPL), down A14 cents to A$1.93, Hunnu (HUN), down A11 cents to A$1.66 and Coal of Africa (CZA), down A13 cents to 1.21. Rare earths were mixed despite the strong performances from Alkane and Northern. Lynas (LYC) lost A2 cents to A$2.53 and Arafura (ARU) was off by A3 cents to A$1.32. Titanium and zircon companies were mixed, although there was one stand out performer, and that was a newcomer too. Diatreme (DRX), one of the merging Eucla Basin zircon companies, added A2.7 cents to A11 cents. Tin companies eased, as did manganese and lithium explorers. If we look at the gold price in the euro, we saw it holding between €1,010 and 1,020 for the last couple of weeks. In the Swiss Franc it is doing much the same. However, in the dollar it has been rising, hitting new highs at $1,475. Today it jumped to €1,026 and through $1,480. If we follow the suggestion of Robert Zoellik the head of the World Bank, that gold should be a ‘value reference' for the gold price, then we cannot look at the gold price in an individual currency, we must look at the currency's value against gold. The reason for this is made clear once you look at the gold price chart in each individual currency. It actually should turn out to be a reverse chart of the currency. Thus gold stands as a ‘value anchor' measuring the value of the currency more than that currency measures the value of gold. So, many investors actually do believe that their currency [such as the dollar] is measuring the gold price, but it isn't. WHAT DOES THE GOLD PRICE MEASURE? A price of anything should measure the demand and supply figures of the item expressed in a static currency price. But there is no such thing. All currencies move against other currencies and against gold. The role of a global reserve currency was supposed to be a currency that was stable and was not printable, expandable or manageable. But the ‘powers that be' decided that it should be inflated to match growth, so that money supply expanded at the same rate as the economy, ensuring that the currency's value did not interfere with its use as something used to exchange for goods. To clarify, if the amount of a currency was fixed, then it should rise in value the more an economy expanded and the need for money rose. This produced a conflict of interest at the root of the money system. This meant it was manageable by people who would not hold true to the concept gold has had through the ages of being firstly a measure of value and secondly as a means of exchange. This has and will result in currencies being less reliable than gold and controlled for the benefit of local economies. Worse still, a global reserve currency, although used by nations all over the world, was subject to its own local economy, central bank and politicians. Yes, this does work, provided the country of the reserve currency is globally dominant, growing and with a balanced Balance of Payments. In the case of the U.S. dollar this is no longer happening. While gold makes for an excellent reserve currency [at the correct price] it was rejected as such, because it could not be printed, it was felt it could not serve as money because it restricted growth of the money supply. That's why the Gold Standard was abandoned. That's why gold was revalued [actually it was the dollar that was devalued] in 1933. While there is now little effort to protect a currency's value it is not in the interests of government to allow their currency to be seen as sinking in value. The concept of currencies devaluing against gold was felt as potentially damaging to that currency so a campaign to relegate gold to solely an important reserve asset in the monetary system took place in the last 15 years of the last century. It worked right up to the end of the last century. From the turn of the century gold has made a comeback, as money, outside the monetary system and has shown this in rising prices and changes in ‘official' attitudes towards gold. But has the gold price really risen? It was held down by the world's central banks, but it is now reflecting the loss of value [not fully so yet] of currencies over time. Under the present global system of money, governments want to have gold ‘rise' in terms of their currencies, not their currencies ‘fall' against gold. WHAT IS THE GOLD PRICE TELLING US? Bankers, central bankers and governments see currencies as having far superior usefulness than gold because of the control it allows over the monetary system. This cannot be over-emphasized. If currencies were anchored on gold then all such controls would become entirely visible. This would not be in the interests of either confidence in money or in bankers/politicians. If central banks felt that it would be as easily harnessed as currencies they would have used gold as a backing for currencies long ago. But their actions do not exclude gold from being money. You can't remove it from the monetary system as we have seen so vividly in the last decade, whether bankers or politicians like it or not. In Asia it is real money and always will be. In the developed world, confidence in the monetary system is waning. Once China has matured to the point that its money becomes a global reserve asset, then the dollar will wane quickly. This will be reflected both in its buying power and its exchange rate. Then it will be unavoidably visible in the gold price that this has happened. The gold price will eventually show its true value by highlighting the value of currencies in exchange rates and gold prices in each currency. The silence from Mr. Zoellik since he put forward his idea on gold has been deafening. But he is right. Gold will no longer be sidelined. Money cannot have one of its two key functions discarded. As a ‘means of exchange' any manner of games can be played. As a ‘measure of value' a currency will eventually return and assess a currency internationally. In the case of the U.S. dollar that day is coming and the consequences of currency management will be felt and seen. The gold price will reflect this. Asian gold investors feel this instinctively, which is why it is one of their leading investments for savings. In the West we can say that there is every interest and benefit to bankers and politicians in ensuring that that day is postponed. Meanwhile, the gold price is telling us the stages of decay the currency system is at. Profit Taking seen dominating the base metals space last week, but rare earth metals continued to shine and a copper-molybdenum deal kept the merger speculation percolating through. Once all the trading was done the TSX Ventures Exchange, home to more junior exploration companies than anywhere else in the world, had dropped 4.1 per cent, while the TSX Gold Index had fared slightly better having fallen 2.4 per cent. Mercator Minerals went shopping and elected to buy Creston Moly in a deal valued at around C$195 million. Under the proposal, shareholders of Creston will receive 0.15 of a Mercator share and C$0.08 in cash for each Creston share held. Of interest to Mercator is Creston’s advanced stage El Creston project in Mexico. El Creston has a measured and indicated resource of 336 million pounds of molybdenum and 281 million pounds of copper. Mercator closed out the week down C$0.13 at C$3.39, while Creston closed up C$0.135 at C$0.56. Elsewhere, Gran Colombia Gold and Medoro Resources have agreed to merge in a move that would create a large Colombia-focused gold miner. Under the deal, each Medoro share will fetch 1.2 shares of Gran Colombia and 0.5 of a warrant. A full warrant is exercisable at a price of C$2.60 until August 24th 2015. Gran Colombia ended the week down C$0.42 at C$1.38, while Medoro closed at C$2.02 for a C$0.08 loss. At the project level, Iamgold sold its 18.9 per cent interest in the Tarkwa and Damang gold mines in Ghana to Gold Fields for a cool C$667 million. Last year, gold production attributable to Iamgold from the Tarkwa mine was 139,000 ounces, while attributable production from the Damang mine was 43,000 ounces. Iamgold ended the week down C$2.88 at C$19.27. Any action in silver, given the price strength? Great Panther Silver failed to rally despite reporting improved production from its Guanjuato and Topia operations in Mexico. In the first quarter gold production came in at 2,310 ounces and silver production tallied 410,640 ounces. Great Panther closed down C$0.19 at C$3.91. And SilverCrest tabled a preliminary economic assessment on the expansion of the Santa Elena project. Investors responded by bidding up the shares by C$0.04 to C41.83. The overall results indicate the potential to increase the production to 39,000 ounces of gold and 1.6 million ounces of silver per year. Meanwhile, Fortuna Silver Mines lost C$0.23 to close at C$6.20 despite announcing that high grade ore shoots have been sampled on the Bateas Vein at its Caylloma mine in Peru. Highlights included 1,225 grams silver, 0.06 gram gold, 0.89 per cent lead, 1.23 per cent zinc and 0.6 per cent copper over a width of 0.86 metres and a length of 160 metres. The company also announced a boost in the resources at Caylloma. In rare earths, Quest Rare Minerals got a boost after reporting a resource estimate for the B-Zone rare earth deposit in Quebec. The base-case resource utilized total rare earth oxides (TREO) cut off of 0.95 per cent and yielded an indicated resource of 36.4 million tonnes grading 1.16% TREO. Quest ended the week up C$1.43 at C$7.95. Well, shares of Nautilus Minerals lost C$0.17 to close at C$3.00 after the company announced that it has formed a partnership with German shipping company Harren & Partner for a vessel that will serve as the operational base for its seafloor resource development. The company has been a granted mining lease for the development of Solwara 1 copper-gold project in the Bismarck Sea of Papua New Guinea. And shares of Allana Potash sold off even after the Ethiopia focused explorer, tagged one metre running 47.81% KCL in the Sylvinite zone on the Dallol project. Allana ended the week down C$0.09 at C$1.85. Hathor Exploration reported the completion of its 2011 winter drill program at the Roughrider uranium project in Saskatchewan’s Athabasca Basin and the results confirmed a third mineral zone dubbed Far East. Hathor ended the week down C$0.12 at C$1.95. Finally, Bolivian exploration plays went on a wild ride after news came out that the government is looking to recover operatorship of certain state-owned mines. South American Silver stated that its Malku Khota project has never had any involvement with the Bolivian State mining company and that its concessions are in good standing. Even so, South American Silver closed down C$0.76 at C$2.39. The global economic data continues to favour high commodity prices but several investment houses came out with statements that the commodity market has now topped out. We will see what next week has in store. GFMS Executive Chairman Philip Klapwijk isn't big on publishing prognostications for the research group's World Silver Survey 2011 report produced for Washington's Silver Institute. After some prodding by Mineweb, Klapwijk said he expect silver prices to remain in the "top $20s" this year. The Silver Survey noted, "Booming silver investment was the primary source of the astounding 78% intra-year [between January and December] increase in silver prices in 2010." World investment demand leapt to 279.3 million ounces last year, which GFMS estimated was roughly equivalent to a net inflow of $5.6 billion into silver. Implied net investment rose by 47% to 178 million ounces, with most of the demand concentrated in ETFs and physical bullion bars. GFMS noted coins and medals demand was also strong last year with offtake increasing 28% to a record 101.3 million ounces. The boom will apparently continue as the 2011 silver price average $31.86 per ounce over the first quarter of this year. However, GFMS observed, "As regards the outlook for prices, GFMS are positive, but cautiously so." "We believe the economic backdrop for investment will in general remain supportive as monetary policy is unlikely to be tightened that much in 2011 and inflation and sovereign debt concerns will most probably grow further," GFMS suggested. "This will encourage investment demand for silver and, importantly, gold on whose coat-tails silver so often rides. Additional support should also flow through from ongoing solid gains in industrial demand." Silver mine production increased by 2.5% last year, thanks to new projects in Mexico and Argentina, reaching a record high of 735.9 million ounces . Substantial increases were also recorded for China and Australia. "Many of the gains at the mine level in 2010 came not from the start of new operations, but from the build-up in production from projects commissioned in 2009, many of which were still undergoing expansion at the end of 2010," said the survey. "Central to the rise were properties in Mexico, where primary silver mines added 9.0 Moz (280 t), helping establishing it as the largest silver production country in 2010. While Mexico reported a 13% rise in silver production to a high of 128.6 million ounces, Peru dropped to number two in silver mine production rankings. Supply from Peru fell by 6% or 7.4 million ounces as two of the largest primary silver mines-Hochschild's Arcata and Buenaventura's Uchucchacua. GFMS predicted, "Silver mine production is expected to record another annual increase in 2011, with increases across the gold, silver and lead/zinc sectors." Primary silver mines accounted for 46% of the gross global increase in silver mine production last year. Production of silver from other metals posted a mixed performance. For the second successive year, silver mine cash costs were relatively flat year-on-year, averaging $5.27 per ounce. "Last year saw a dramatic return to net producer hedging, with 61.1 Moz added to the global hedge book, a volume just short of the 1997 record high, lifting the global hedge book at year-end to 86.7 Moz," the survey said. The most significant hedging activity last year came from Minera Frisco, which made numerous additions to its hedge book at year-end, covering silver, gold and base metal production. GFMS calculated that Frisco's hedge position totaled 50.3 million ounces on a delta-adjusted basis, with 24.8 million ounces of forwards, and the balance comprise of options. Net government sales of silver increased by 188% to 44.8 million ounces in 2010 as GFMS estimated that total government silver stocks stood at 109.6 million at the end of the year. Meanwhile silver bullion imports into China, Hong Kong and Singapore fell last year, while South Korean and Japanese bullion imports grew markedly due to recovery in industrial offtake, GFMS advised. Last year world silver fabrication demand grew 12.8% to 878.8 million ounces, which came within touching distance of the previous record high of 900.7 million ounces of offtake set in 2000. Industrial demand rebounded by 21% last year to 487.4 million ounces, which GFMS attributed to the easing of the global recession and pipeline restocking. Silver demand in photographic applications fell by 8% in 2010, which GFMS said is "the first single digit percentage drop seen in five years." Meanwhile jewelry fabrication rose to a five-year high of 167 million ounces. Klapwijk was scheduled to present the World Silver Survey 2011 report at a New York City conference Thursday morning. China's absence from the copper market has dampened confidence in the bullish on the annual conference of the world's largest copper in Chile, before staging a rebound. Even if copper prices plunge soon, as industry players gathered here expect with China sitting on the bench, the top copper consumer is seen returning to the market and driving prices to new highs by year end. China's absence from the copper market has dampened bullish conviction at the world's biggest annual copper conference in Chile, with copper CMCU3 prices seen sinking around 20 percent in coming months from life highs of $10,190 tonnes in February, before staging a rebound. Speculation has been rife as to whether China will return to the spot market this quarter, with many industry insiders expecting purchases to be delayed and pointing to rising warehouse stocks MCU-STOCKS. "You will get volatility, and I think that is what we are seeing right at this moment in time. But its going to be a short-term volatility period," said Andrew Harding, CEO of Rio Tinto's (RIO.L) copper unit chief executive. "But the longer-term story actually says there's good demand and that supply is actually struggling to keep up," he added. Harding believes the world copper supply deficit could hit half a million tonnes this year and that the shortage could extend beyond 2013. His view for the year is wider than the market consensus of around 400,000 tonnes. Credit Suisse expects Chinese demand to remain robust, citing a divergence between apparent consumption data and underlying demand. "While the weakness in the physical market is unambiguous, indicators for underlying demand have remained strong," the bank said in a research report. "We believe this gap will be closed primarily through a rebound in imports and refined production. Recent draws of non-bonded Shanghai Futures Exchange stocks may be the first sign that this transition is already underway," it added. China's interest rate hikes are fanning fears of a deeper slowdown. The Chinese central bank raised rates on Tuesday for the fourth time since October as it seeks to counter price pressures in the world's top base metals consumer. A source at a small Chinese copper merchant, which buys just 2,000 tonnes of refined copper and 300,000 tonnes of concentrate a year, said the company had no plans to buy from the spot market because of rising capital costs and negative arbitrage of Shanghai-LME. "An interest rate rise is not good news for the copper price," he said. Fears of more cut backs in China mixed with strong market fundamentals has left some at the conference feeling deflated. "Usually I leave this conference feeling bullish copper, but this year it's different. It's not bearish, it's flat," said a banking source. But there are some bright spots. Some see signs of a tightening in China's scrap market, the first stop to source metal before moving to the open market. "China is out of the market and has been for six months. That's not sustainable, even with interest rate rises. After working through quite a few cycles, the fact they're not buying now doesn't spook me at all," said a trader at a large Swiss merchant. Gold and silver futures made ​​history on Wednesday, with the highest value due to the position of the investors collectively take a safe position on precious metals, in addition to the weakening U.S. dollar will worsen the condition. Gold notched a settlement and an intraday record high and set its sights on $1,500 an ounce. Silver stopped just pennies short of the psychologically important $40-an-ounce level, hitting a 31-year high on its way. Gold for June delivery (GCM11 1,457, -1.40, -0.10%) rose $6, or 0.4%, to settle at $1,458.50 an ounce on the Comex division of the New York Mercantile Exchange. The contract climbed as high as $1,463.70 an ounce earlier, according to a preliminary tally available at the CME Group’s website. CME owns and operates Comex. The settlement and the intraday nominal records supplanted the previous milestones reached just the previous day. “The geopolitical situation is going from bad to worse,” said Afshin Nabavi, head of trading at MKS Finance in Geneva. “Everybody is talking about gold at $1,500 [an ounce]. As soon as gold breached through the $1,450-$1,450 mark, fresh money came in as some investors scrambled to be part of the rally, Nabavi added. Gold at $1,500 is certainly possible in the short term, although a more orderly, slower rise over the next month or two would be more desirable, he said. The metal hit a record of $875 an ounce in January 1980 — the equivalent of $2,350 an ounce in today’s dollars. In addition to ongoing fighting in Libya, where rebel forces and government forces continue to vie for the upper hand in a NATO-led military intervention, Europe’s debt crisis came back to the fore this week as Portugal appeared to get closer to asking for a bailout. “Prices are likely to remain buoyant as risk aversion increased on the back of Moody’s downgrade of Portugal’s credit rating,” analysts at ICICI Bank wrote to clients. Moody’s Investors Service cut Portugal’s rating by one notch to Baa1 from A3 on Tuesday, saying a bailout for Portugal seemed very likely. The focus on Portugal intensified as the country had to pay hefty yields to sell short-term bonds on Wednesday. Investors are concerned that a rescue for Portugal will also rock Spain, an economy bigger than Portugal, Ireland and Greece combined. A finance-ministry spokeswoman confirmed the comments, according to Reuters. European Union officials, however, have yet to receive a formal bailout request from Portugal, according to The Wall Street Journal’s online edition. Meanwhile, silver for May delivery (SIK11 3,940, +0.80, +0.02%) rose 20 cents, or 0.5%, to $39.39 an ounce — the latest in a string of 31-year highs for the metal. Investors kept their sights on silver at $40, and some believe it would be only a short time from that to the nominal record above $50 an ounce that spot silver hit in January 1980. The broader suite of metals were mostly stronger, with copper for May delivery (HGK11 435.70, -1.30, -0.30%) rallying 11 cents, or 2.5%, to $4.37 a pound as miner bellwether Rio Tinto PLC (RIO 72.80, -0.17, -0.23%) predicted an even tighter market for copper than most analysts expected. Palladium and platinum diverged, however. June palladium (PAM11 787.05, +2.45, +0.31%) declined $8.50, or 1.1%, to settle at $784.60 an ounce. July platinum (PLN11 1,797, -1.30, -0.07%) added $1, or 0.1%, to $1,797.80 an ounce. A further downgrade to Portugal's credit rating helped boost gold prices to an all time record on Tuesday of $1,456.85 as investors continued to worry about debt problems in the euro zone. And, if Nicholas Brooks, head of Research and Investment strategy at ETF Securities, is to be believed it is exactly these concerns that are likely to have a growing role to play in the gold market. Brooks said the growing demand for gold as an alternative currency, which has built up steadily since the financial crisis of 2008 is one of the key factors underlying the current strength in the gold price and, is one that is likely to continue. "Going back to the first euro crisis in early 2010 there were very substantial inflows into gold of all kinds with gold ETPs seeing very substantial in flows during that period." But ,added "It doesn't mean that they are selling all their paper currencies or assets," he says, but rather that they are "putting a larger proportion of their assets in gold." The main reason for this he says, has been the tendency of governments to continue running extremely large debt burdens. And, the concern is always, he says, that these governments will be tempted to inflate their way out of the problems such deficits cause. And, when this factor is added to the shift in attitude by Central Banks who have once more become net buyers of gold and the continued demand for gold from areas like China and India and the structural picture for the yellow metal looks sound. Brooks does caution however, that there could be some shorter-term, more tactical factors that could alter gold's performance in the near term. "Generally, when interest rates are rising - certainly if they are rising at a rapid pace - gold underperforms and now with inflation rising in many economies across the world there is a rising belief that the ECB, possibly eventually the Federal Reserve, Bank of England may start to raise rates and that may take some of the steam out of the gold market rally." But, he adds, the ability of Central Banks to raise interest rates will be somewhat hobbled by the banking and real estate issues that remain prevalent in many of these regions. He also says that there is a strong possibility that the very large debt burdens tied to the necks of many of these countries are likely to be a drag on growth. Thus, he says, "The interest rate headwind to the gold price is likely to be somewhat temporary and also ultimately not prove to be all that strong." He adds, "As long as the environment remains risky, as long as the peripheral European sovereign risk remains an issue, as long as the Middle East remains in turmoil, there is always going to be a demand for an asset like gold." "The key risk to the gold flows this year would be a substantial and sustained rise in global interest rates but again my own view is based on the need for fiscal tightening that is unlikely - ultimately if they look out through the year investors will probably continue to take a bar-bell approach to investing hedging out sovereign risk through gold and other instruments, hedging out Middle East risks through oil and other instruments like that and remain long risky assets until there are signs that global is slowing. So ultimately the trends that we have seen in the first quarter of this year are likely to continue through 2011." From the destruction argument, which shows the gold is in a bubble and a reaffirmation of some of the factors driving gold higher and higher, Frank Holmes observed twice the price of gold in 5 years. Last week Frank Holmes had participating in a webcast for Bloomberg Markets Magazine regarding gold investing. It was a very insightful presentation and Frank Holmes suggest you view the replay at www.bloombergmarkets.com. What struck me on the call was the negativity surrounding the gold market. Call it a bubble, a frenzy or mania, there seems to be a large number of voices in the marketplace who just are not fans of gold, whether prices are moving up, down or sideways. However, gold prices appear asymptomatic of the signs generally associated with financial bubbles. For instance, we haven't seen price spikes. Despite rising from under $1,000 an ounce to over $1,420 over the past six months, that represents only a 0.7 standard deviation move for gold prices, according to Credit Suisse (CS). The average standard deviation move of other bubbles-Japanese equities in 1986, the tech boom in 1999, the GSCI in 2005 and gold in 1979-is 5.3. Gold's 180 percent move in 1979 represented a 10.3 standard deviation move, more than 14 times the magnitude we see today. The reality is that gold doesn't possess the traits necessary for a financial bubble to form. Rodney Sullivan, co-editor of the CFA Digest, has done some great research on the history of markets and bubbles going all the way back to the 1600s. He discovered three key patterns in the 47 major financial bubbles that occurred over that time period. These three ingredients of asset bubbles are financial innovation, investor exuberance and speculative leverage. The process begins with financial innovation, which initially benefits society as a whole. In the exuberance stage, usage of these innovations broadens; they become mainstream and attract speculation. The third step, the tipping point for a bubble to form, is when these speculators pile on massive leverage hoping to achieve greater success. This excessive leverage adds increased complexity, which mixes with irrational exuberance to create an imbalance in the marketplace. Eventually, the party comes to an end and the bubble bursts. This is what happened with the housing bubble in the U.S. as Main Street home buyers leveraged themselves 100-to-1, Fannie Mae leveraged itself 80-to-1 and Wall Street investment firms leveraged themselves over 30-to-1. Gold as an asset class is far from being overbought by speculators. Eric Sprott recently did a fascinating presentation explaining how underowned gold is as an asset class. Sprott wrote that despite a 30 percent increase in gold holdings during 2010, gold ownership as a percentage of global financial assets has only risen to 0.7 percent. That's a big increase from the 0.2 percent level in 2002, but Sprott points out that it's misleading because the majority of that increase was fueled by gold appreciation, not increased level of investment. Sprott estimates that the actual amount of new investment into gold since 2000 is about $250 billion. Compare that to the roughly $98 trillion of new capital that flowed into other financial assets over the same time period. Gold equities have seen even lower levels of investment. From 2000 to 2010, $2.5 trillion flowed into U.S. mutual funds, but only $12 billion of that went into precious metal equity funds. Of course, those figures were significantly impacted by the advent of gold ETFs during the decade. Despite the growth of the SPDR Gold Trust (GLD), which held more 1,200 tons of gold as of March 31, gold remains largely underowned as a portion of global financial assets. The bar chart from CPM Group shows gold as a percentage of global financial assets over time. In 1968, gold represented nearly 5 percent of financial assets. In 1980, the level had fallen below 3 percent. That figure had shrunk to less than 1 percent by 1990 and has remained there since. Sprott wrote that "it is surprising to note how trivial gold ownership is when compared to the size of global financial assets." That point is magnified by the pie chart from Casey Research. 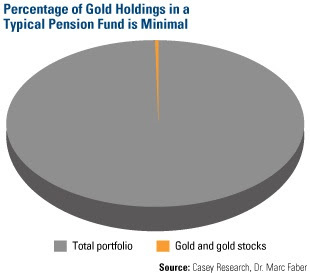 Dr. Marc Faber included it in his April newsletter to show just how small a portion gold and gold stocks are for large institutional investors like pension funds. 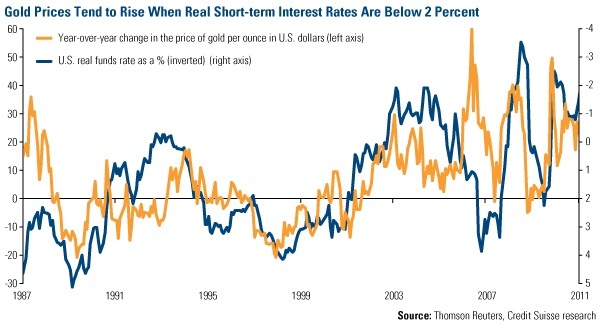 Investors who don't think gold is a bubble but fear they've missed the boat need to look at the short- and long-term factors supporting gold at these historically high price levels. In the near-term, gold prices are being buoyed by continued weakness in the U.S. dollar. * Combination of low real interest rates, steeply upward-sloped yield curve and perky inflation expectations that should continue in the U.S. This is part of what we call the Fear Trade. This graphic illustrates that the Fear Trade is a function of two separate government policies: monetary and fiscal. Whenever there is a structural imbalance between a country's monetary and fiscal policies, gold tends to perform as a "safe haven" currency. Currently, the quantitative easing measures implemented by the Federal Reserve and the significant size of the deficit spending by the government to increase entitlements to ward off a recession have created a significant imbalance between monetary and fiscal policies. This has devalued the U.S. dollar which, in turn, has boosted gold prices. We believe that as long as the U.S. government refuses to trim entitlement and welfare programs and continues to keep Treasury bill yields below the inflation rate to battle deflation, gold will remain an attractive asset class. 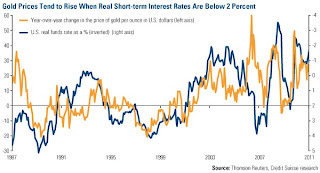 Longer-term, our experience shows that whenever you have increased deficit spending, rapid money supply growth and negative real interest rates-that's when the inflation rate is higher than the nominal interest rate-gold tends to perform well in that country's currency. So far we have not seen rapid money supply growth here in the U.S., but the other two factors have been the main thrust behind gold's record rise. GFMS CEO Paul Walker echoed those drivers in an interview with MineWeb this week. Walker said that "ultra-low interest rates, macro-economic dislocation, fears of global imbalances...the wrath of these things still remain solidly in place and that's really the bedrock of the gold bull rally." CS says the combined $6.3 trillion of excess leverage in the G4 economies (U.S., eurozone, Japan and Great Britain) means that their central banks will be forced to push real interest rates down to abnormally low levels. You can see from the chart that this is quite bullish for gold prices. Any time the real Fed funds rate is below 2 percent, gold tends to rise. Current projections from the Congressional Budget Office (CBO) have the U.S. federal deficit at $1.5 trillion this year. 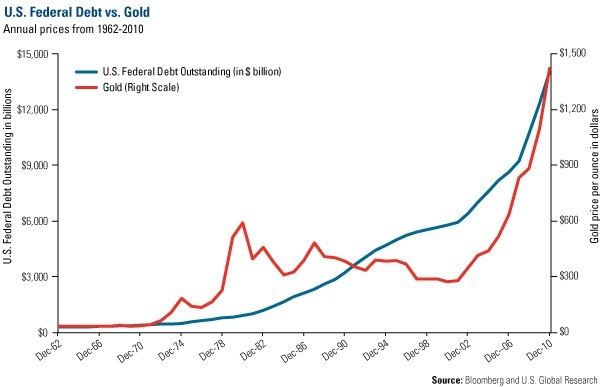 To show the effect this has had on gold prices, we overlaid the rise in U.S. federal debt with the price of gold. You can see from the chart that gold's bull run began in 2002, about the same time federal debt began to rise significantly. Gold played catch up at first, but the two have tracked each other rather closely. 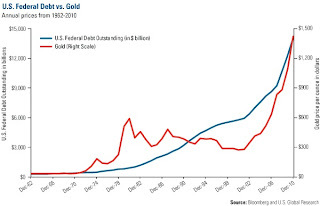 Since 2002, gold prices have risen 308 percent versus a 119 percent increase in federal debt. This means that gold's sensitivity to a rise in federal debt is just over 2-to-1. With lawmakers in Washington, D.C. still squabbling over where and by how much to cut the budget, it's unlikely the federal debt level will recede any time soon. This is very constructive for long-term gold prices, but just how bullish depends on who you ask. The team at CS sees gold at $1,550 per ounce by year end. BCA estimates gold to remain in the $1,400-$1,600 range in 2011. Walker of GFMS said he believes gold will surpass the $1,500 mark by year end because "all of the structural factors supporting gold are in place." Perhaps the most bullish forecast has come from Rob McEwen, former gold analyst and founder of GoldCorp, who said late last year, and reiterated last week, that he thinks gold could hit $5,000 per ounce in the next three to four years. It's important to remember the strong cultural attraction that many people in emerging countries have toward gold. It's a much stronger connection than that of the developed world and essential for rising gold demand. We like to compare the G-7 countries to our E-7-the world's seven most populous nations. Interestingly, the G-7 is 50 percent of global GDP but only 10 percent of the total global population. The E-7, on the other hand, represents roughly 50 percent of global population but only 18 percent of global GDP. We would like to point out that money supply and GDP per capita is rising substantially faster in the E-7 than it is in the G-7, 17.7 percent money supply growth in the E-7 versus 3.7 percent in the G-7. If money supply growth in the E-7 continues at a rate of 15 percent or more for the E-7, it would be a strong catalyst for higher gold prices. In conclusion, based on the above factors and trends, we believe gold could double over the next five years. Note: Standard deviation is a measure of the dispersion of a set of data from its mean. The more spread apart the data, the higher the deviation. Standard deviation is also known as historical volatility. M2 Money Supply is a broad measure of money supply that includes M1 in addition to all time-related deposits, savings deposits, and non-institutional money-market funds. The U.S. Trade Weighted Dollar Index provides a general indication of the international value of the U.S. dollar. The S&P GSCI Spot index tracks the price of the nearby futures contracts for a basket of commodities. The following securities mentioned in the article were held by one or more of U.S. Global Investors family of funds as of 12/31/10: Goldcorp, SPDR Gold Trust (GLD). From the GFMS report to Silver Institute published last week, which is used as the basis in this article on supply and demand for silver in the last three years. The purpose of this article is to have a recent history confirms what we expect from the future for silver. The first fact that jumps off the page is that the future for silver looks remarkable with industrial silver demand predicted as rising nearly 37% from 15,160.19 tonnes [487.4 million ounces] in 2010 to 20,712.29 tonnes [665.9 million ounces] in 2015. Much of the growth in this global total of industrial silver consumption will be driven by stronger demand for a number of established uses including the manufacture of electrical contacts and the use of silver in the photo voltaic industry. New uses center on silver's antibacterial qualities, while other new uses tend to make use of its conductive properties, including solid state lighting and Radio Frequency Identification (RFID) tags. Overall please note that silver's importance in the technology of the day is huge. We go so far as to say that the demand from silver has transformed from a want to a need! Whether we are in a boom or bust silver's demand will remain robust. It is now needed to make all facets of an economy run well and at all levels, even down to individual needs. This secures its future and assures us that silver prices are well supported. Here is the list of the amounts used in different applications that emphasize this point. - Cell phones used 404.35 tonnes [13 million ounces] of silver last year. - Computers consumed 684.29 tonnes [22 million ounces]. - Thick film PV consumed 1,461.90 tonnes [47 million ounces] in 2010. - Automobiles which used 1,119.75 tonnes [36 million ounces] of silver. - Electrical and electronics demand for silver reached an all-time high of 7,555.21 tonnes [242.9 million ounces]. - Solar Power in 2011 is expected to reach 2,177.29 tonnes [70 million ounces], up 40%. - RFID tags in 2010 reached between 31 and 62 tonnes with a long way to go before reaching full market. - Water purification used 62 tonnes [2 million ounces] set to grow to 74.65 tonnes [2.4 million ounces]. - Medical applications may grow strongly to reach 93.3 tonnes [3 million ounces] by 2015. - The use of nano-silver in goods packaging and hygiene combined would consume 124.4 tonnes [4 million ounces] of silver over the next five years. While photographic use of silver allows for a high proportion of re-cycling, reclamation of silver from most of the above uses is difficult to nigh-on-impossible. This in itself assures either a constant or rising demand for these applications. Of particular note is the growth in Asia where we are watching around half of the globe's population developing at infrastructural level as never before. This growth will continue at double figures, per annum for at least the next decade. Gold is rarely consumed as it is deemed far too valuable. Reclamation efforts relative to the value of the gold ensures that scrap merchants will go to extraordinary lengths to recover the gold. In silver's case these efforts would cost more than the sale of the silver so used. As the silver price rises further reclamation efforts will become profitable and more silver will be recovered, but we are still a long way off from that day. HSBC, the world's largest bullion dealer [in both gold and silver] is confirming that silver's role as a monetary metal is gathering the most momentum, particularly in emerging economies. They say that the macro economic trends from emerging markets are positive for both gold and silver. They put the growing Chinese middle classes [now well over 400 million people of the 1.3 billion Chinese citizens] as fueling an "explosive" growth in demand for silver as a hedge against fast rising inflation. The Industrial and Commercial Bank of China, the world's largest bank by market value, agrees this. I.C.B.C. sold 13 tonnes [418,000 ounces] of physical silver to Chinese citizens in January, alone, compared with 32.97 tonnes [1.06 million ounces] for the whole of 2010. We have seen China turn from an exporter of silver to a huge importer in the last three years. And that's just the start! China was a net importer of over 3,110.42 tonnes [100 million ounces] of silver last year, whereas while it was selling ‘official' holdings of silver only a few years ago it was exporting an equal amount annually. China's ravenous new demand for silver as a store of value in inflationary times is growing exponentially. This is illustrated by the fact that silver imports last year increased four-fold over 2009. While we don't yet have the numbers for supply of silver in 2010 we do not expect them to have risen more than 10% over 2009 levels. Once we have these we will pass the information onto you. With 70% of silver mined as a by-product of base metal mining there is a danger of demand outstripping supply. The present sources of by-product silver are operating at peak capacity. Pure silver producers like Silver Wheaton are growing but unlikely to be able to fill the gap. Mines like Coeur d'Alene which is becoming a 50% gold and 50% silver producer do have a considerable capacity for growth and will do so. But again with demand burgeoning on both the investment and industrial sides supply will find it difficult to meet demand. Another difficulty for suppliers is that they are inflexible because of their dependence on mining. We do foresee rising scrap sales from the developed world where the sight of a profit on jewelry etc, can prove too tempting to the individual, but we cannot see this being more than 10 to 20% more than in 2009. In the emerging world such a concept is basically foreign to them because both silver and gold represent financial security to investors there. If the developed world were stable and if the emerging world was used to their newfound wealth, and were their history not as close to social rupture as it has been and could be, emerging market investors would probably not trust gold and silver as much as they do now. But that is the case now. We believe [if history is to guide us] that it will take at least another generation [25 years] of wealth and stability in the emerging world for this attitude to change. Until then scrap supplies from the emerging world will remain at extremely low levels. In 2011 we are seeing prices far above those imagined three or four years ago. But then the world is facing far more uncertainty and instability that was ever imagined then too. The decay of currencies' abilities to measure value has been increasing over that time too, making the soaring prices of silver and gold to become more than plausible. Indeed a strange feature of the silver price has been it moves with gold as though tied with a piece of elastic string to the gold price, rising higher and falling lower at each move. So why does it not move more like copper or another base metal used as a simple commodity? And where, if it doesn't move like them, is it headed?